When Digby, John and I were first getting to know Ted Lieu, back when he was still a state Senator, we asked him why he was willing to leave the young family he's so devoted to in L.A. and spend so much time in Washington, D.C. He told us it actually had a lot to do with his two sons-- a compulsion to help turn Congress towards solving the accelerating problems around Climate Change. And, sure enough, last month when Ted was named the freshmen Democrats MVP, his unrelenting work-- with members on both sides of the aisle-- for climate change was first and foremost in everyone's mind. That and... cyber-security, equal rights, criminal justice and marijuana legalization. Yeah, he's been busy. But last week, hot on the heels of his promotion to full colonel in the Air Force Reserve, Ted, along with two other freshmen military vets in the House sent a letter to Speaker Paul Ryan urging him to withdraw his endorsement of Donald Trump. "As veterans who previously served on active duty," they wrote, "we are horrified by Republican presidential nominee Donald Trump's slander of parents whose son died serving our country. Mr. Trump has already made a series of racist and sexist statements. But the profound disrespect Mr. Trump has shown toward Gold Star parents is a new low. Your continued endorsement of Mr. Trump's hateful, bigoted and sexist vision threatens the integrity of the House of Representatives in which we serve. We respectully request that you follow what we believe your heart is telling you and withdraw your endorsement of him now." Thursday, Ted announced he is introducing legislation to make it more difficult for a president to launch a nuclear attack. “The erratic and impulsive behavior of Republican presidential nominee Donald Trump has highlighted the structural dangers of America’s nuclear weapons launch protocols. Having taught the Law of War when I served on active duty, and as a graduate of Air War College, it is clear to me that the traditional checks and balances on the Executive branch do not apply when it comes to nuclear weapons. This process needs to be fixed. “The President does not need approval from Congress or the courts to launch nuclear weapons. All the President needs is the concurrence of the Secretary of Defense, who is appointed by the President. This week Blue America is helping Ted raise funds for his reelection campaign. As a thank you we are giving away 6 advance copies of the next book by neuroscientist Dan Levitin (author of the massive NY Times best seller, This Is Your Brain On Music. 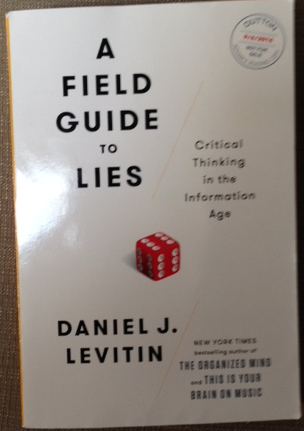 Dan, a big admirer of Ted's, autographed half a dozen advance review copies of A Field Guide To Lies-- Critical Thinking In The Information Age for half a dozen randomly selected contributors. There is no minimum contribution; everyone is equally likely to be picked to "win" one of the signed books. Dr. Levitn told us Friday that: "My wife and I had dinner with Ted Lieu recently and it was one of the most fascinating conversations we’ve ever had. He has a deep knowledge about a wide variety of topics, and shared many insights with us. He is exactly the kind of person we need to have in government: smart, empathetic, honest, and eager to devote his considerable talents to public service not for his own personal gain, but to help make the world a better place. He's committed to clearing the logjam that congress has become, using his intelligence and creativity to move forward policies and legislation that will benefit all of us." Just contribute any amount by Tuesday evening at midnight at this Blue America ActBlue page to be eligible. This is one of my worst fears about Trump, going nuclear. He is a danger to the world, let alone to the USA. Trump would likely pride himself on being the first to use nuclear weapons against an entire people. Hillary would not want to be known for this. Well, as microscopic a chance Rep Lieu's bill will ever see the legislative light of day, it would be VERY interesting to see HRC's reaction to the idea.